Specifications: 22" or 24" notched or smooth blades, 1 1/2" square gang rods, 9" spacing with extra heavy cast iron spools, trunion mounted self aligning triple sealed bearings with wear guards, 3" x 3" tubular frame, gang angling from 12 to 24 degrees, reversible Cat I and II A frame hitch and center shank. Widths: 6 sizes from 6'6" to 9'8". Weights: 1895 to 2326 pounds. Options: blade cleaners, dirt shields, toolbar extension, rear utility hitch, Cat I hitch and add a blade extensions. Features: This 3 point tandem disk is the #1 vineyard disk in California vineyards. Gang angling is simple with pins. The reversible hitch can be relocated to the rear simply by removing and relocating pins. 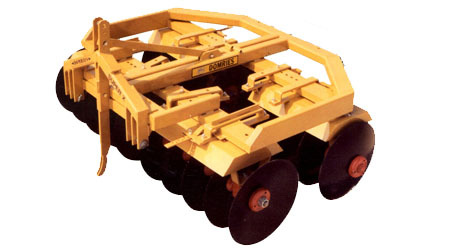 A 3 in 1 implement for regular disking, reverse disking or for flat furrowing.